As the cost of healthcare continues to grow at unsustainable rates, there has been an increasing emphasis on ensuring that the care being delivered by individual clinicians is evidence-based. From optimal medical management of heart failure patients to appropriate cancer screening regimens, its important that clinicians know that the recommendations they make to their patients is supported by available data. 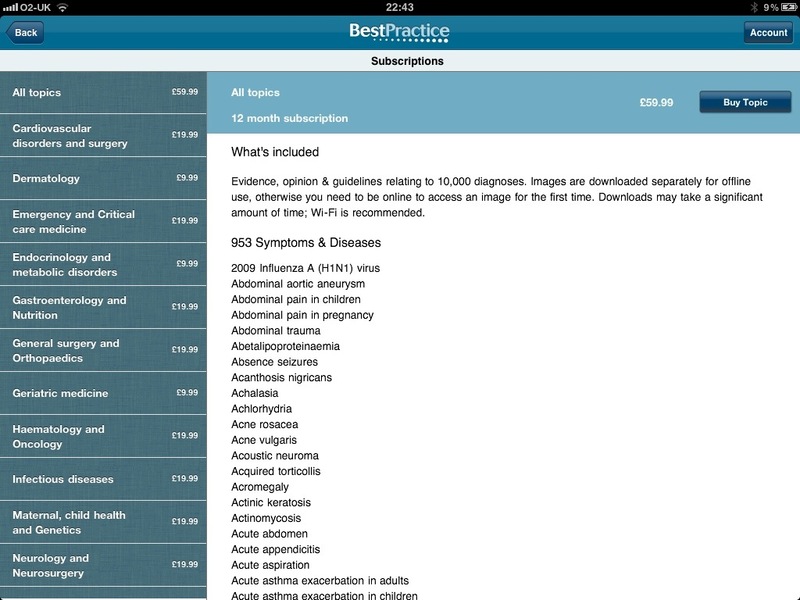 The Best Practice app is a point of care tool from the BMJ Evidence Centre designed to support clinicians in their decision making from diagnosis to treatment. Decision-support information is provided with a step-by-step approach that is structured around the patient consultation, diagnosis, treatment, management and prevention. Despite a few drawbacks, this app has the potential to make a positive impact on patient care. …a clinical decision support tool that uniquely structures research evidence, expert opinion and guidelines around the patient consultation. 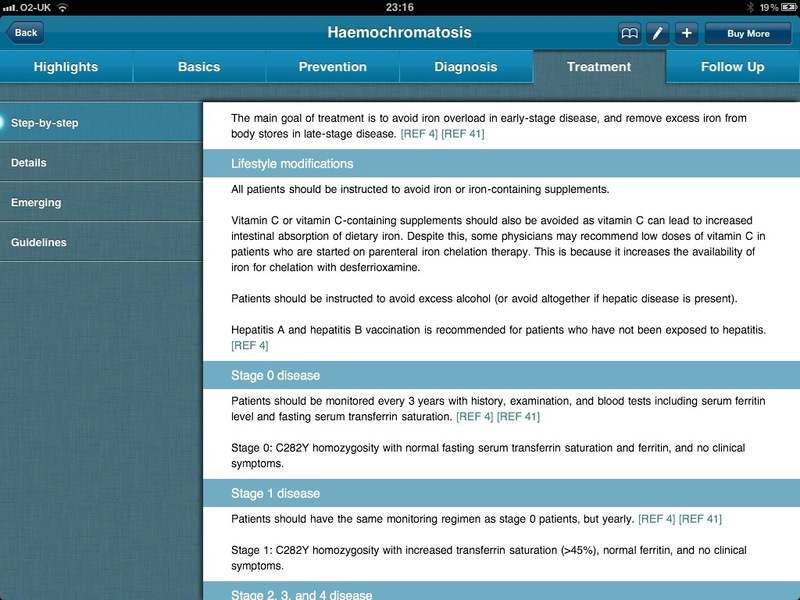 It provides quick, easy-to-use answers to clinical questions about diagnosis, treatment and management of patients. 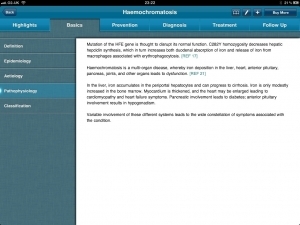 This universal application is well laid out with clear menus and is quick to navigate to a desired topic on either iPad or iPhone. 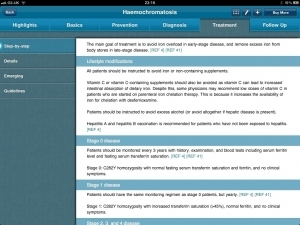 Each topic contains a wealth of information allowing clinicians access to all the important information related to a specific condition/disease. Peer reviewed expert opinions and management guidelines are all included along with a complete set of clinically relevant notes. This includes a wide range of sub-topics including etiology, differential diagnoses, and detailed examination information – shown below is one such topic, haemochromatosis (click on the screenshots to get the full detail). 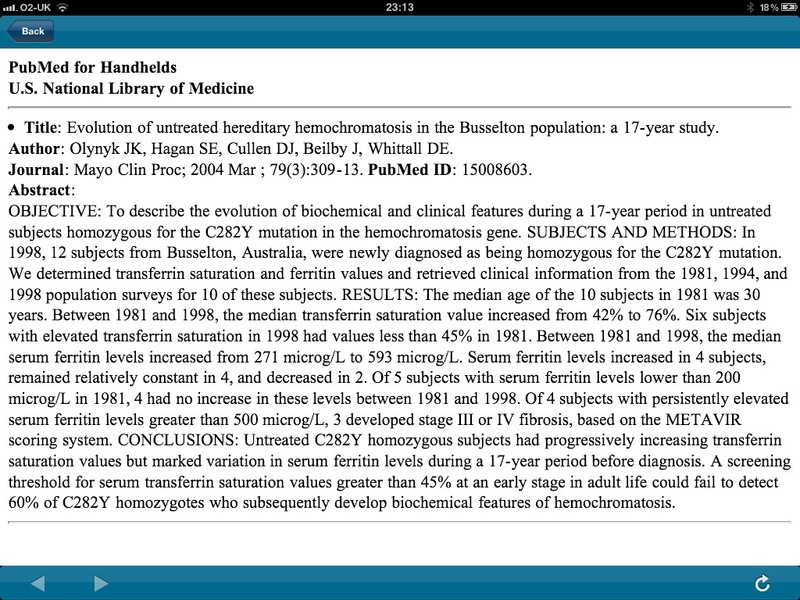 Evidence based treatment options are discussed complete with detailed references. 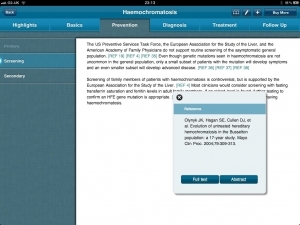 Purchasing a subscription to this application offers full access to the internationally renowned evidence database Clinical Evidence. 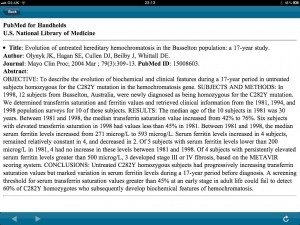 Both abstracts and full text articles can be read within the application itself. There are over 4,000 full text diagnostic and treatment guidelines from international and regional organisations included which will ensure that clinicians are in no doubt of the treatment options available. It is difficult to convey just how much information has been compressed into a highly useable form by the BMJ Evidence Team. Every section of each topic has been thoroughly researched and designed to display the core information required by clinicians to make informed decisions. Diagnostic procedures and results are clearly laid out and easy to follow. 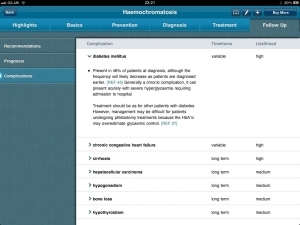 In addition, users can mark favourite conditions or add their own notes for later reading. 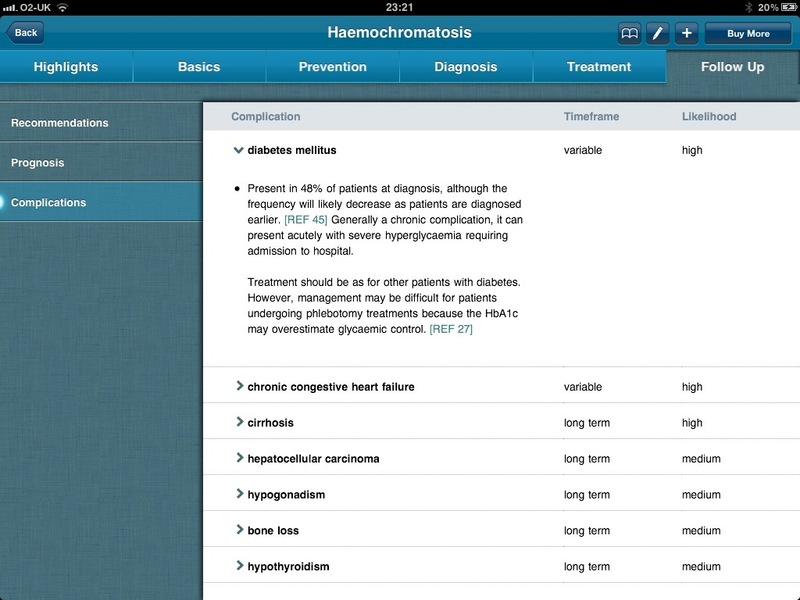 The Best Practice app is very detailed, containing evidence based clinical assessments of over 10,000 diagnoses. 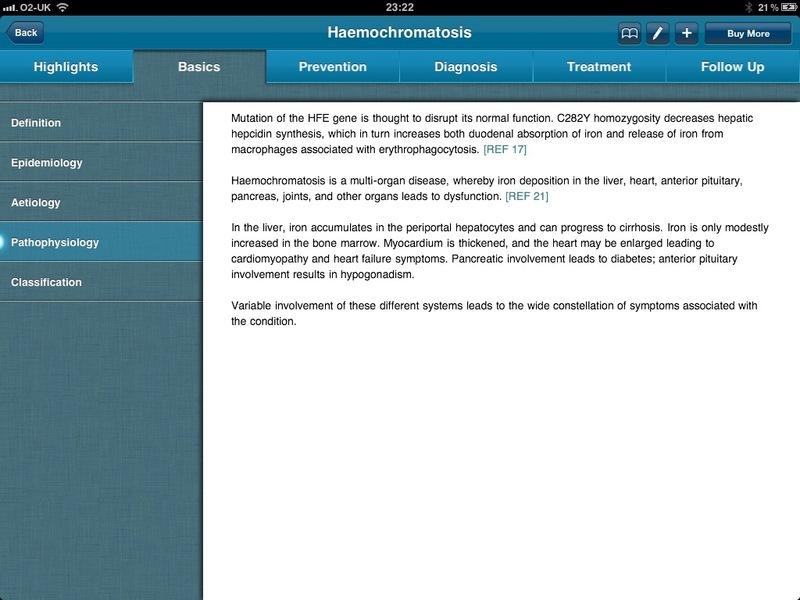 However this does come at an in-app purchase price of £59.99 per annum for the complete set of topics. It is also possible to buy individual collections of topics if desired for a range of prices. A major drawback of this application is the lack of hyperlinking between topics. This negatively affects the ability to search for and access, topics, sections and other relevant information. Another drawback is the high cost of the application although this is mitigated by its impressive utility in clinical scenarios. In summary, this application deserves a very high rating due to the wealth of concise, evidence based information. Best Practice marks a major step forward for evidence based clinical decision making tools and would be a useful addition for many clinicians. The lack of hyperlinking does not tarnish what is essentially a very useful and well designed application. There are very few apps out there which combine such detailed information and impressive utility with an attractive functional interface.